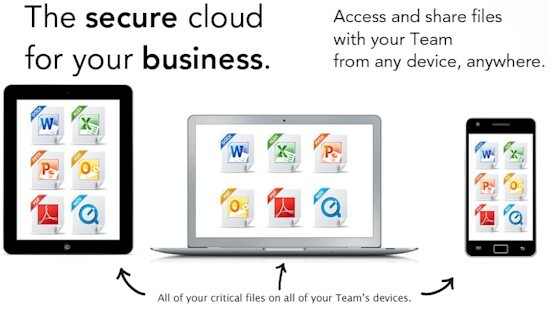 Summary Business-focused cloud service with a mix of document creation and file sync features. You can always tell when a market is starting to go mainstream when products start appearing that aim not to innovate, but offer incremental improvement, streamline the process and combine functionality. Such is the case with Soonr, a product aimed mainly at small to medium businesses. Soonr can best be described as a product aiming to combine the best of Google Docs' online editing, with Dropbox & Sugarsync's syncing abilities. This is very similar to Box' model, although Soonr does not have all the enterprise features (yet). The major difference is Box integrates Google Docs directly, whereas Soonr has built its own online editing suite. So what features does Soonr have, exactly? Soonr calls out eight specific features, although if you're familiar with Google Docs and Dropbox/Sugarsync/Box, you already know most of these. Most are self-explanatory, so I'll dive into what I think is the most convoluted yet powerful part of Soonr: collaboration. Soonr's collaboration model takes things a step further than most by adding the concept of projects. Projects are basically folders that you define a specific level of access for, for different groups. The easiest way to describe groups is Members vs. Connections. Members are generally internal to a group and Connections are external (such as consultants, clients, suppliers). Members can create projects, and have a storage quota assigned by an administrator. Connections can access projects (defined by the creating member or an administrator), but cannot see other projects, create projects, or have a storage quota. That last bit is a little strange to read, but basically means Connections have read-only access. Connections can also make modifications if granted "Full access" rights. Account-wise, Soonr is straightforward. The entry level account (called Premium) has three member seats, two connection seats, and 25 GB of storage for $9.95 USD a month or $99.50 a year. Pro accounts get five member seats, 100 GB of storage, and 20 connections for $29.95/month or $299.50/year. Also, Pro accounts can custom-brand their Soonr portal. A third, custom option beyond Pro lets you choose more storage, member seats, or connections for a custom price. All accounts get six months of file versioning, with no option for unlimited (like Dropbox's Pack Rat option). We tested the 30-day trial of Premium, since that will be most people's first impression of Soonr. The signup process was easy and required no credit card. Once logged in, you're dropped at the Soonr Dashboard. Someone at Soonr had a love affair with Web 2.0 I think, because both the main website and the actual product have all kinds of giant buttons, flashy colors, gradients, and drop shadows all over the place. The marketing website is particularly overrun with it. Once you get past the visual overload, the Dashboard is set up fairly well, which you can see in the screenshot gallery. The dashboard itself provides a quick rundown of the current state of Soonr, which is available in more detail on each tab. The Projects tab is where you will end up spending most of your time. From here, you can create new projects and access the files in each project. Once inside a project, you can view individual files and, depending on your level of access, can download, upload, archive, delete, view it in a browser using Soonr's "rendering" engine. You can also print or fax (assuming you've configured those). Faxing was an interesting option, and it turns out to use eFax, an online faxing service. I didn't see the fax feature mentioned anywhere on the marketing part of Soonr's website, so I imagine some people might never even realize it's there during their trial. Part of the process is also to install the Soonr Agent software on your PC, which is available for Mac OSX and Windows. I tested the MacOS application, which worked quite nicely overall. It sets up very similarly to SugarSync, providing a central "workspace" folder, which is where all your projects show up. You can also "backup" other folders on your computer into the system, assuming you have the space alotted to do so. Computers view when no Computers are added. Setting up the agent software just requires logging in. The installation toasts with an announcement message. The agent runs right next to dropbox in the task bar. The system preferences pane gives an overview of your current usage. You can choose what to sync, when, and how. Backups allows you to sync other folders aside from the workspace. Network will configure different speeds for different connections. About screen for the Agent. Once you sync a computer the computers tab shows that update. Settings area for managing your team settings. View of the Personal Docs "project". A view of the website after a login issue that broke the website view. Adding a connection is quick and easy. Creating a project is also quick and easy. You can then manage the project and add people to it. Viewing from a connection is much more limited than a normal member. I dumped about 40 files of various types and sizes into the default Personal Documents project that every member has available by default (but isn't visible to others). Soonr quickly began syncing, and easily saturated the 4 Mbps upload speed of my cable connection. There are a number of different options and tabs that I've detailed in the screenshot gallery. One thing to note is that Soonr's preferences use Kilobytes, not Kilobits, when denoting network transfer speed. This is somewhat confusing as I've pointed out with other products that do this, because network speed is defined using bits, not bytes. To give an example, my 4 Megabit cable connection equates to approximately 512 Kilobytes. Viewing all those files online worked well, although the website only provides a "rendering" of things like Microsoft Word documents. This is different from Google Docs, where you can actually edit those files too. It worked similarly well on the iOS and Android mobile applications, which was surprising, given Microsoft's lack of presence on Android. The iPad application strangely is the only part of the whole process that allows you to edit files and then upload the changes. I'm unsure why this function is limited specifically to the iPad application, and is not available via the website. Android "offers" editing as well, but only if you have the proper apps installed to handle the document format. Sharing files happens on a Project level within Soonr itself. If you have access to the Project, you have access to all the subfolders. This keeps it simple, although some might yearn for more granularity. You can also send out URL links to people not in Soonr, and Soonr will make specific files publicly available via those links. "Connections", i.e. people with read-only access, can still download files and modify them locally. They just can't upload them. One of the more interesting features Soonr brings is the concept of "comments", which can be transmitted via SMS to mobile devices. This facilitates collaboration, although I honestly view the SMS messaging as something of a gimmick. I didn't find the SMS feature terribly useful as SMS is so constricted that you can't see what context the comment is being made in to respond appropriately, but I'm sure some users will find the constant stream of feedback useful. I did have one funny issue with the website when I was automatically logged out after inactivity. You can see it in the one screenshot, but basically it looks like Soonr reloaded the HTML inside the old HTML frame. This is purely a display bug though, and can be fixed by logging out and logging back in manually. Access is done mainly via the website, although the Mobile applications stand very well on their own. Most of the bad reviews of the iOS app in fact are because people didn't see the button to create a free trial account. The website, though, is where you manage connections, i.e. who has access to what project. You'll have an easier time managing files there, too. Files are uploaded through the desktop client, although you can upload individual files via the website. The website is the only place you can view file revisions though, which can be problematic when editing files on tablets and you want to go back a revision. Security is a little overblown by the marketing materials. Soonr claims to be more secure than Dropbox. But the documentation doesn't actually state the encryption used, other than SSL connectivity to the server. There is a mention of some kind of encryption at rest on a fairly hidden part of their website, which I'm assuming is actually their old website that is still accessible. 256-bit encryption sounds like AES encryption, but without documentation it's impossible to tell. When we say we are more secure and trustworthy, a lot of this comes down to the fact that we are not relying on Amazon for our infrastructure....We offer Soonr through many ... partners [who] trust Soonr to provide this service to their customers. This trust was not build in a day, it was built by providing a high level of uptime, availability and of course security. Before any of these partnerships were formed, Soonr was taken through rigorous security audits and requirements. For example Soonr is HIPAA compliant, which is explained in detail along with other security compliance and certifications on our website at http://www.soonr.com/privacy/. Support is primarily via a form on Soonr's support site, which also has a phone number you can call. In closing, Soonr has a very nice product that works very well. For the base price, Soonr outstrips Dropbox by a long shot, although Dropbox for Teams is significantly cheaper when compared to Soonr with the same amount of storage (1 TB of space). That said, Soonr combines features of Google Docs as well, with a strong mobile offering. However, you can get 90% of the Soonr's features using Google Docs (no syncing or backup) and Dropbox for Teams (no backup) for significantly less money. So I would recommend going that way if you need a lot of storage. But for users who don't have a high storage requirement, Soonr provides a very compelling product that I can easily recommend.